Apple set free OS X Lion to the general public yesterday. The only way to upgrade to the new OS was by way of downloading it from the Mac App Store. Apple has received its fair share of criticism for making Lion download-only. This limitation makes it so that if you have multiple Macs at home, you have to download Lion on each PC (yes, they are personal computers after all) separately. We’re going to solve this issue for you today, by making a Bootable Flash Drive of Lion! An empty flash drive with at least 4 gigabytes of memory: An 8GB flash drive would be recommended. Once you are in possession of the abovementioned items, follow the guide written below! Step 2: Once downloaded, go to the Applications folder and find the copy of Lion you just downloaded. Step 3: Right click on the downloaded file and select “Show Package Contents”. Step 4: Go to “Contents” and jump inside the “SharedSupport” folder and you’ll find a file titled “InstallESD.dmg”. Copy this over to the desktop. Step 5: Plug in a USB flash drive to your Mac having at least 4GB memory. We highly suggest going ahead with an 8GB one just to be on the safe side. Step 5: Now open up “Disk Utility” and drag InstallESD.dmg from the desktop to the left-hand sidebar. Select the attached USB from left side and click on “Partition” tab. Step 6: Select “1 Partition” from the Volume Scheme dropdown menu. Choose “Mac OS Extended (Journaled)” from the left. Step 8: Once the drive has been formatted, click on “Restore” (it’s right next to where you clicked on “Partition in Step 5). Step 9: Choose USB drive you plugged-in in Step 5 as “Destination” with the InstallESD.dmg file as “Source”. Step 11: Reboot your Mac with the USB drive plugged in. Hold the “Option” key on your keyboard when you hear the iconic OS X startup chime. You can now boot into your Flash drive from there. Step 12: Follow the on-screen instructions to install OS X Lion. You may then follow Steps 11 and 12 to install Lion on all your Macs. 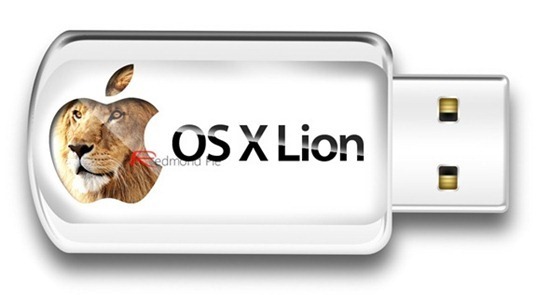 Apple will make $69 USB flash drives of Lion available at Apple Stores in August. If you made your own flash drive following our guide, you just saved $40, my friend. Pat yourself on the back for a job well done! If USBs aren’t your thing, you can follow our guide on how to make OS X Lion bootable DVDs.